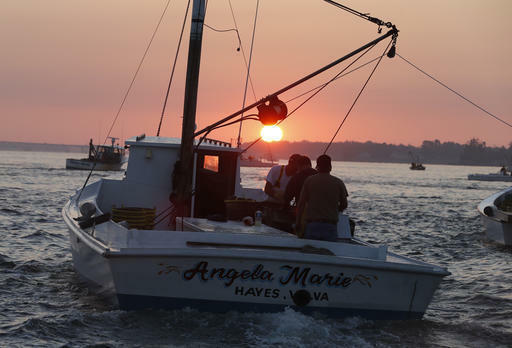 President Donald Trump's budget proposal would eliminate federal funding for the program that has coordinated Chesapeake Bay cleanup efforts for decades. Trump's spending plan for the 2018 budget year, released Thursday, significantly reduces funding for the Environmental Protection Agency. President Trump's budget blueprint to “Make American Great Again” would cut EPA funding for the Chesapeake Bay by $73 million, ultimately killing federal programs to eliminate pollution that’s been plan plaguing the bay for decades. The cuts would remove EPA oversight of efforts to clean up the Chesapeake bay and its streams, creeks and rivers. It also would end years of federal cooperation to restore the bay's biggest economy: striped bass, oysters and blue crabs, warns scientist Don Boesch. "We're trying to restore the oyster population," Boesch says. "That's very heavily dependent on the continued federal investment in the restoration efforts in a partnership with the states. We've worked very hard to recover the rockfish populations from where they were back in the 80's. Same thing with blue crabs. We've got new management approaches and they're recovering." Those species are susceptible to low oxygen areas called dead zones caused by pollution. Will Baker, President of the Chesapeake Bay Foundation, says the burgeoning oyster industry in Maryland and Virginia would take a big hit. "Dockside value is where you start in looking at the total economic impact, then you have to have shuckers, wholesalers, retailers, those who move the material, restauranteurs, etc, etc. But just the dockside value, about $43 million for the bay, so that's significant," he says. The president's plan is to hand funding responsibilities over to already financially stressed state and local entities. Governor McAuliffe said the cuts will do significant harm to Virginia's families and economy.